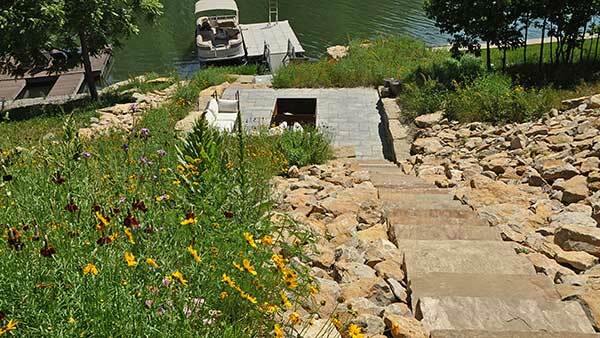 The clients’ intent for the project was to build access to their boat dock and the lake, create a lakeside gathering place and repurpose a rock pile left over from their home construction. 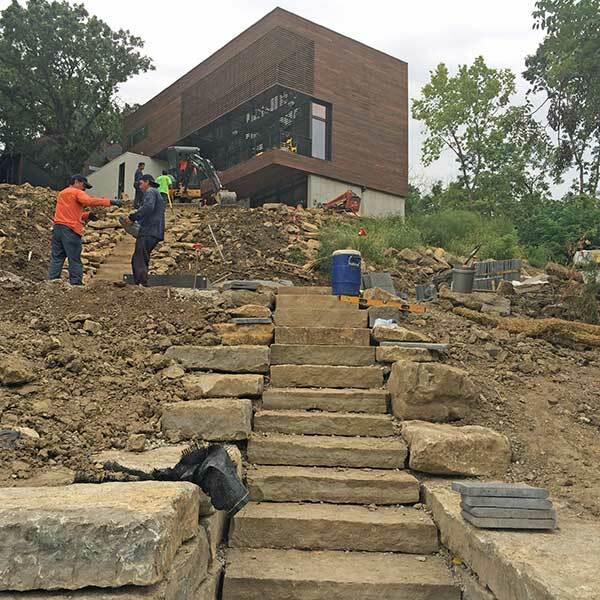 The final design used natural stone for the steps down to the water—an easier installation than forming and pouring concrete on the steep terrain. 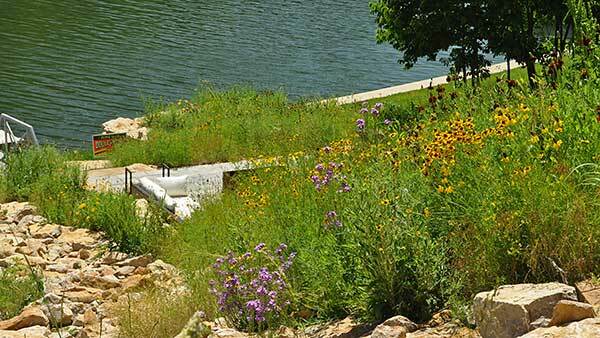 The team planted native seed mix on the hillside, and irrigated the native plants with lake water. 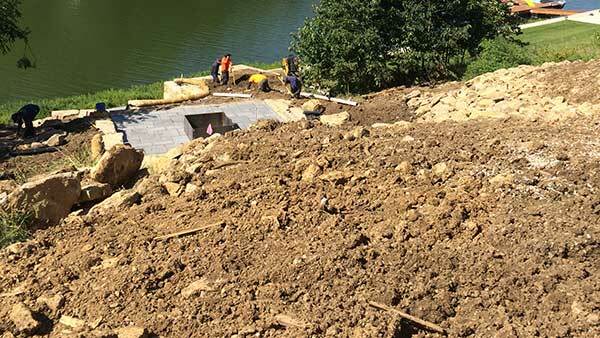 A big block from the seawall was moved and used as a retaining wall near the boat dock. The Embassy team met the clients’ goals using additional creative solutions, such as channeling the roof drainage system into a dry creek bed along the hill to take water down to the lake and turning the rock pile into riprap lining the hillside. The project earned Embassy Landscape Group a 2017 Grand Award from the National Association of Landscape Professionals’ Awards of Excellence program. This rustic gathering space has been carved into a steep prairie hill. 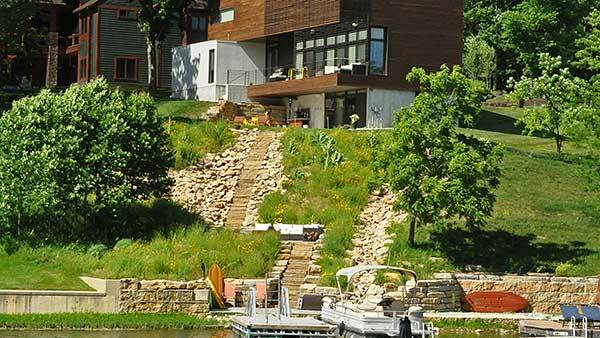 The clients’ contemporary lakeside home was built on a hill looking out over a large lake. Stone steps provided access to the water, connecting the upper terrace with a midlevel patio and lower landing. Before—The construction site at the start of the project. 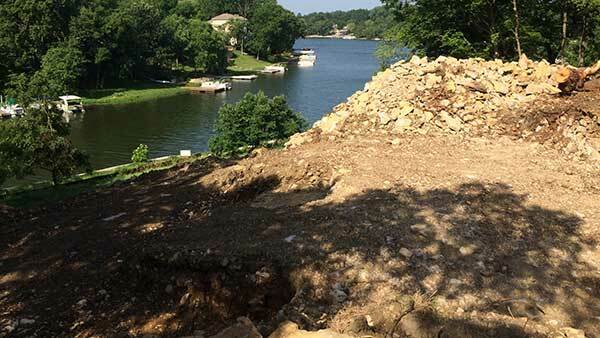 Excavators left tons of limestone rock piled on the crest of the hill, and the owners did not want to haul it off-site, leaving behind a design/build challenge. Stone slabs lead to the steps going down the hill. View during construction with crews installing a water line from a lake pump used to irrigate the lawn around the house. 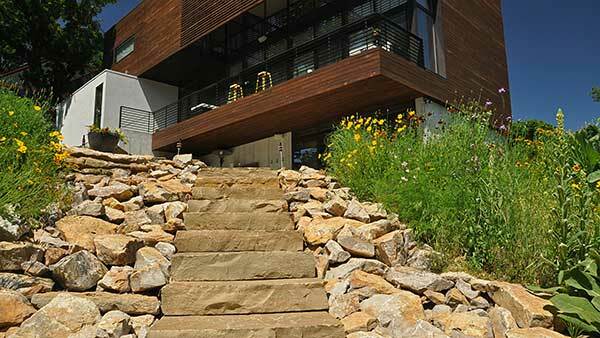 Stone from the foundation excavation is used to cover the slope and provide erosion control and a decorative way to get rid of the construction spoils. 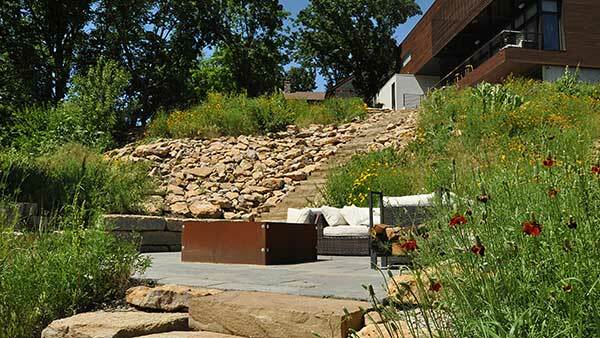 A native prairie mix was sown on the poor soil on the hillside. 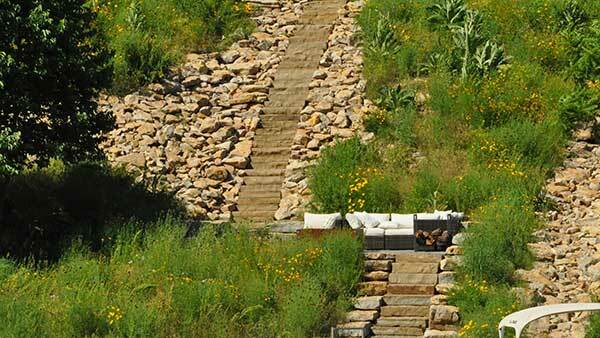 Native plants thrive on this sunny hillside with minimal maintenance. Stone riprap provides a pathway for water from rooftop drains to reach the lake without creating erosion issues and lake contamination. Sterile wheat initially was used as erosion control on the project. 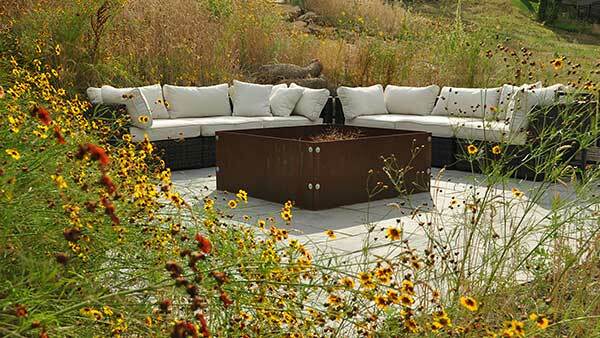 It provides an interesting contrast to the colorful wildflowers and rusted Corten steel fire pit. 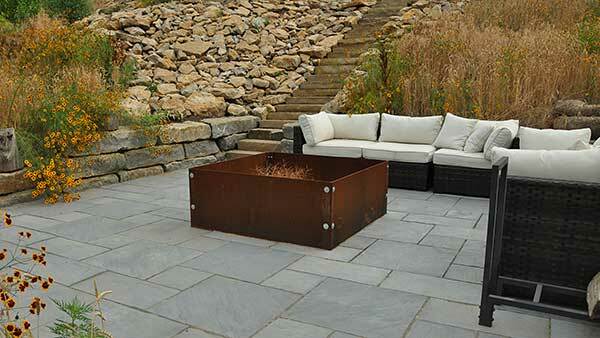 A manufactured stone patio provides a beautiful surface for the contemporary patio and complements the natural stone used on the hill and retaining walls. 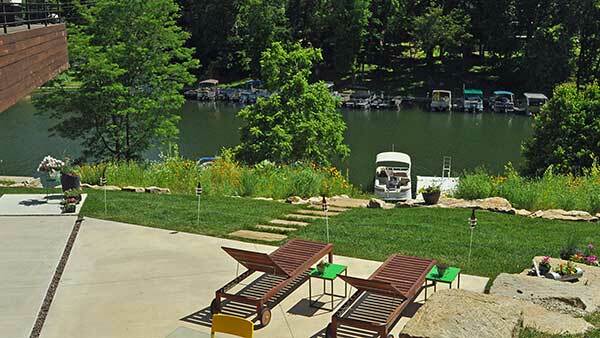 View from lakeside landing of the house, stairs, hillside and patio. Crew setting stone steps, integrated with boulders and riprap. Photo of steps detailing craftsmanship of crew and blending of construction debris in a creative fashion. 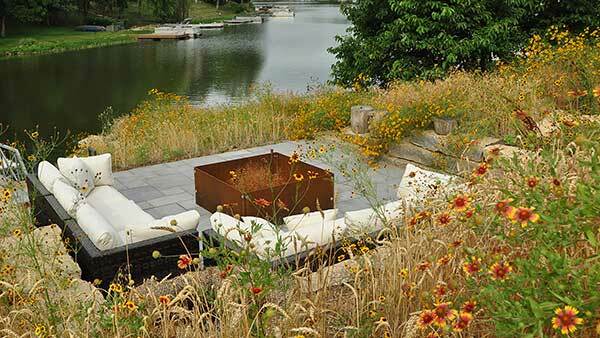 A dramatic view of the finished steep hillside with native plant material harmonizing to create a perfect place to enjoy a view of the lake with family and friends. 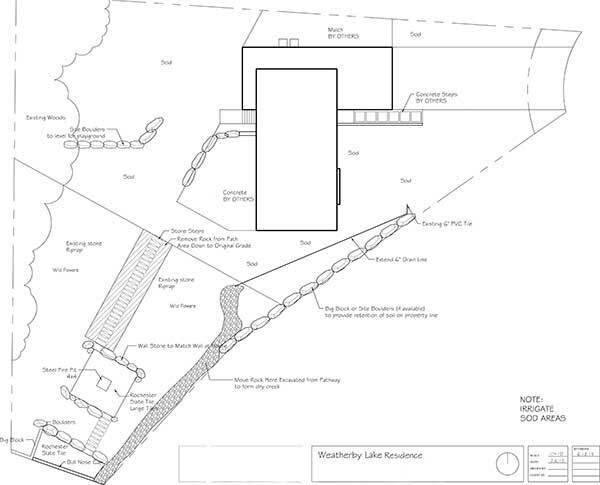 The initial construction plan for the project.